The fat droplets of diluted can be seen shaking and vibrating due to Brownian motion. and observations of the river sample back home. There are many different ways how animals acquire their food but one group of marine nematodes found a way to “farm” it on the outside of their bodies. The photos in this article are of a thin section of Granite. 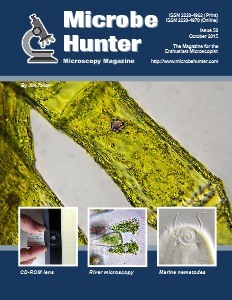 The lens of a CD-ROM or DVD player can be placed on a mobile phone camera for basic microscopy.